Glacier National Park Description. 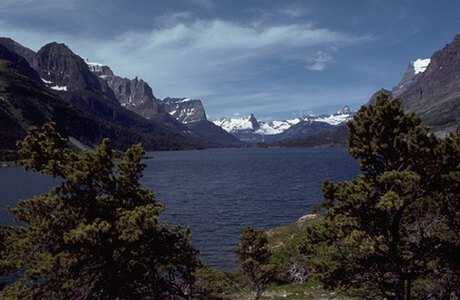 Glacier preserves over 1,000,000 acres of forests, alpine meadows, and lakes. Its diverse habitats are home to over 70 species of mammals and over 260 species of birds. The spectacular glaciated landscape is a hikers paradise containing 700 miles of maintained trails that lead deep into one of the largest intact ecosystems in the lower 48 states. The park contains over 350 structures listed on the National Register of Historic Sites and six National Historic Landmarks. In 1932 Glacier and Waterton Lakes National Park, in Canada, were designated Waterton-Glacier International Peace Park. This designation celebrates the longstanding peace and friendship between our two nations. Glacier and Waterton Lakes have both been designated as Biosphere Reserves and together were recognized, in 1995, as a World Heritage Site.